If your bathroom vanity top is like most – it can be downright scary. Creams, makeup, hairspray and sticky purple medicines all fighting for space. Your countertop has to take a “lickin’ and keep on tickin’.” Since there are a lot of choices in vanity tops choosing one can be tough. One popular countertop material – whether you need a standard or custom size – is solid surface. You know when you are remodeling there are often too many choices. Selecting a bath countertop, flooring, shower enclosure or shower fixtures can blow your mind. In this article, I’m not dumb enough to attempt to try to give input on all the components you may want in your remodel. I will look to give you feedback on one option, which is stone solid surface tops. I’ll dig in to give you concrete answers to your slippery questions about solid surface countertops. At the end of the article if you have more questions shoot them at me (if you have more input for others chime in with what you’ve learned). FAQ #1 about solid surface bath vanity countertops – Are they expensive? I would put the cost of a solid surface bath vanity top in the middle as far as different options in vanity countertops go (that’s a politically correct answer!). They are more expensive than laminate (which is still a popular choice in starter homes) but less expensive than natural marble, quartz or granite countertops. What is nice about these countertops is they are usually ordered with an integral bowl underneath – which makes them more cost effective since you’re not paying for a countertop and a bowl separately (also you know the bowl and top will work together!). 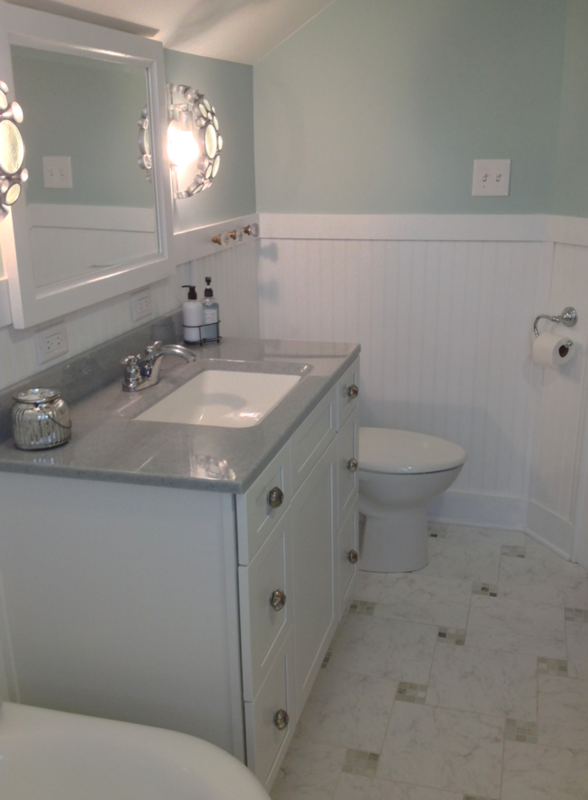 FAQ #2 about solid surface bath vanity countertops– Can they grow bacteria? Solid surface and Corian countertops are a favorite for hospitals and Doctor’s offices because they aren’t a breeding ground for bacteria. In contrast, materials like granite already have bacteria in them before they are installed in a bathroom remodeling project – so even sealing a granite top will not seal out bacteria (it is already there, unfortunately). Laminate countertops have seams and tile counters have grout joints – all potential breeding grounds for bacteria. When it’s critical for you and your family to do “germ warfare,” solid surface is a logical choice. FAQ #3 about solid surface bath vanity countertops – Are these tops hard to clean? Is there anything I need to do to protect against hard water? It doesn’t take a rocket scientist or a chemist to determine the right brew to clean a solid surface countertop. The best cleaning solution is simple mild soapy water. On the other hand – there is one bit of caution you should use in cleaning. Don’t use any abrasive cleaners on these tops. If you’re concerned about hard water deposits create a 50/50 mixture of white vinegar and water to get your top clean. 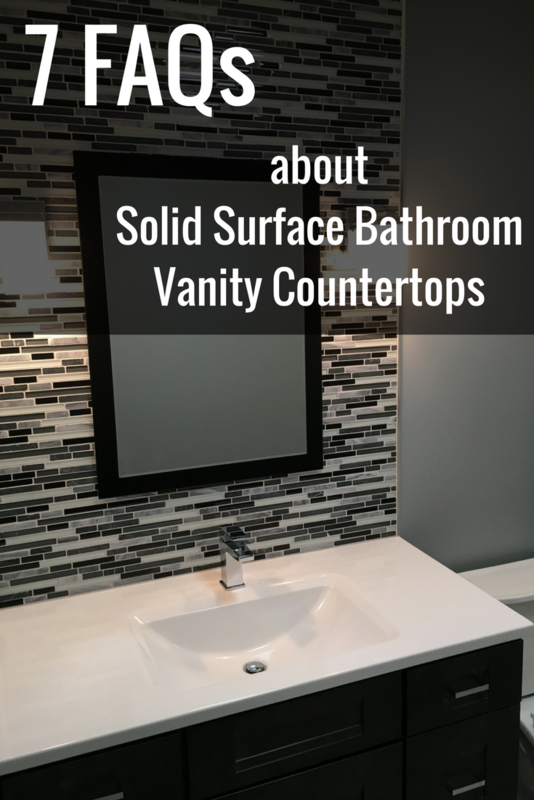 FAQ #4 about solid surface bath vanity countertops – Can they be customized to install into vintage furniture or a cabinet I already own? Will it work with traditional, transitional or contemporary tops? Customization is one of beautiful things about this type of top. You can order them in different thicknesses (5/8”, 1” and 1 ½”) with 5 different edge treatments (raised, flat, ogee, beveled and a double eased edge), 19 different bowl styles and 51 color choices. If you need one hole or 4” or 8” hole spacing the holes can be predrilled where you want them. In addition, the bowl can be put in the spot you want for a unique piece of repurposed vintage furniture, period-specific vanity cabinet or any type of bathroom design. The flexibility of these tops is huge. FAQ #5 about solid surface bath vanity countertops – What color choices do I have? Can I make the top one color and the bowl a different color? Back in the mid 1970’s (yes – I’m showing my age here) Burger King’s advertising campaign was “Have it Your Way.” At the time, this was a revolutionary concept in a fast food restaurant -to get your burger the way you wanted it. Today we demand this service in the age of “mass specialization” or take our business elsewhere. You can choose design choices to match your tile, your shower enclosure or your bathroom cabinet selection. Solid surface countertops (and the integral and seamless bowls which go with them) offer you a wide range of colors. Yes, you can have the top be one color and the bowl another. If you’ve got any angels in your family (OK I must admit we have NONE in mine) you can even put a “halo” (a small decorative ring around the bowl). 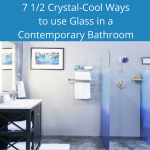 It’s even possible to choose bold colors for an ultra-modern bathroom. 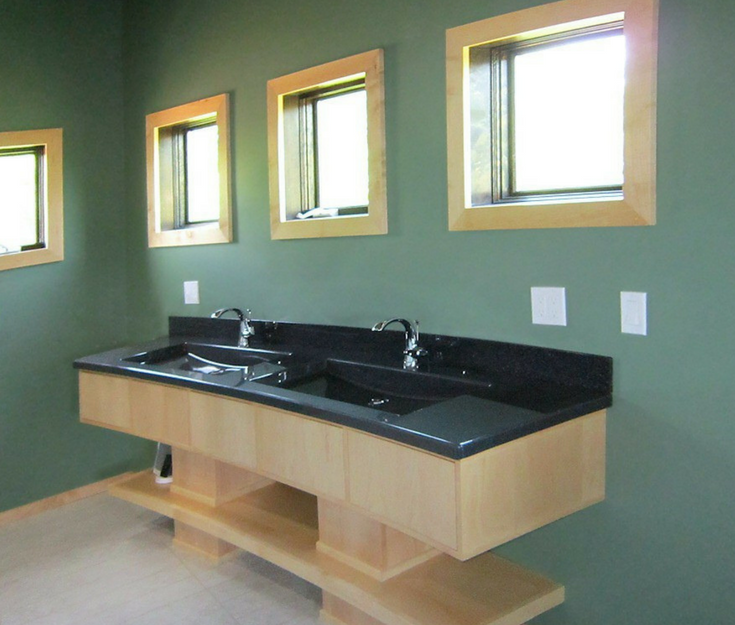 FAQ #6 about solid surface bath vanity countertops – How does the process of ordering a custom solid surface top work? How long does it take to get a custom top? 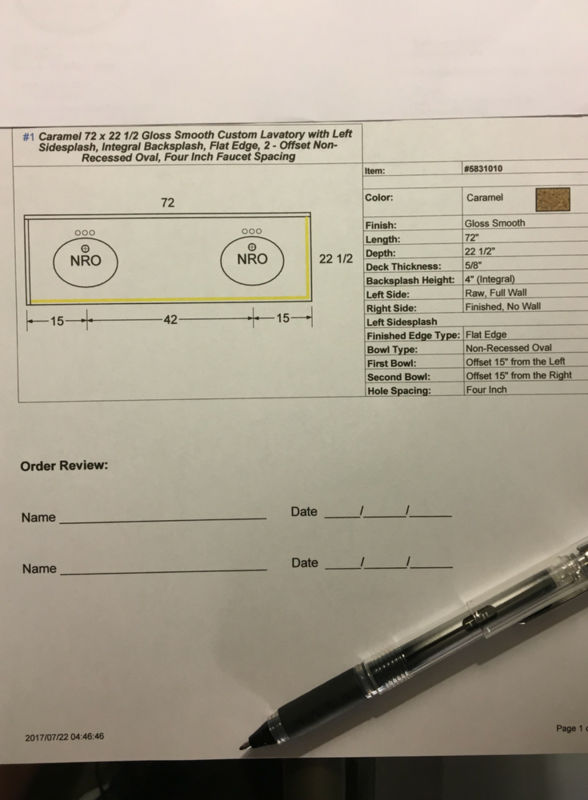 After you order a custom solid surface countertop, you will get a detailed drawing to approve. This sketch allows you to make sure your top is the right size, the drain holes and bowls are in the right spots and the correct edges are finished. You can also check you have backsplashes and side splashes where the top butts up to a wall. Once you approve the drawing your finished custom bath top will take 3 weeks for you to get it. 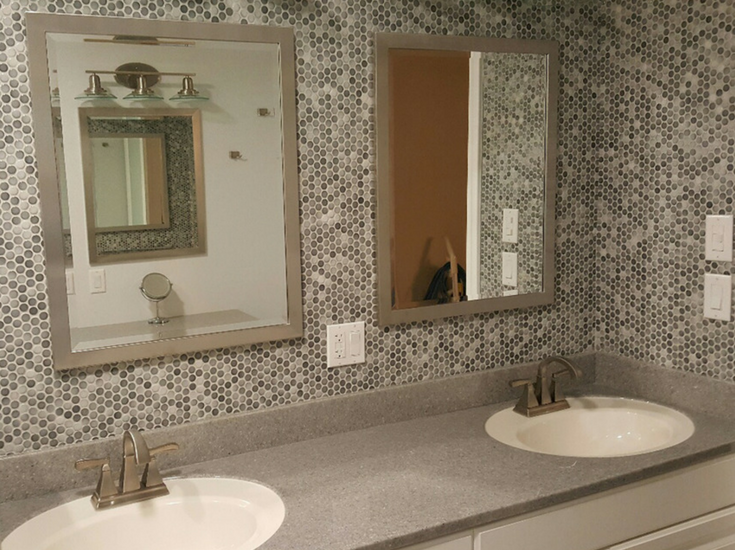 FAQ #7 about solid surface bath vanity countertops – Can a DIY homeowner install these vanity tops without a professional contractor? Whether your bathroom lavatory is standard or custom made the installation process is simple and DIY friendly. You will first dry fit the top onto your cabinet to check how it fits. Second, if you need to do any sanding, cutting or notching to get the proper fit you can use basic carpentry tools like circular saws, jig saws and belt sanders. The third step is to apply silicone around the drain flange and attach the drain to the top. Fourth, put a few spots of silicone along the top edge of the cabinet and set the countertop in place. The last step will be to add any side splashes between your top and walls. I hope I was able to “fill in the blanks” for most of your questions about solid surface countertops. Understanding I may not have covered everything what you want to know please comment below or call me at 877-668-5888. 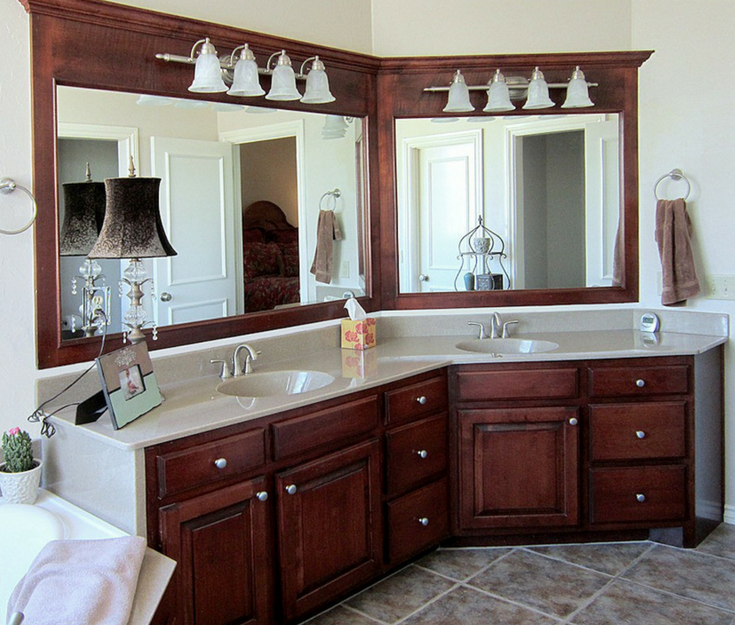 We would love to help you with your next bathroom remodeling (or bath vanity countertop) project. If you’re looking for a nationwide factory-direct wholesale supply of solid surface countertops call us at 877-668-5888. If you would like a professional remodeling company to help install your top or do a complete remodeling project for you call Cleveland Design and Remodeling at 216-658-1270.